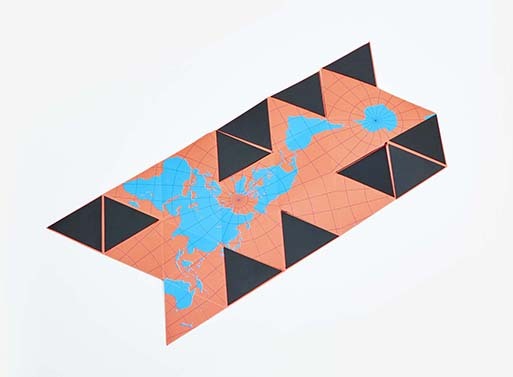 You may be familiar with Buckminster Fuller’s 1946 patented a map of Earth, as it presents no visible distortion of the relative sizes of land masses. 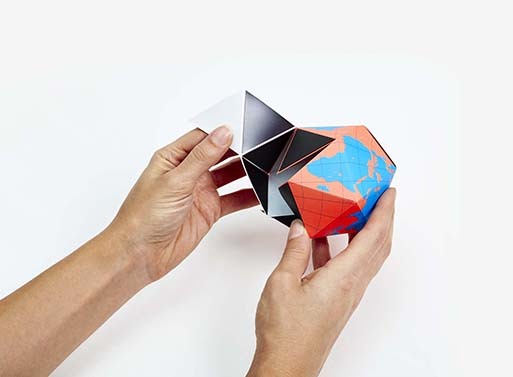 Designer Brendan Ravenhill has taken Fuller’s projection (and architect Shoji Sadao’s hand drawn 1954 Dymaxion Projection) and turned it into a magnetic folding globe, which means we all have something to do with our hands next time we’re waiting for a brainstorming session to strike. Fold it into a geometric globe or unfold it to see our planet flattened out. Available in blue/green, black/white, and blue/orange.